A dozen Turkish tanks have rolled across the Syrian border after heavy shelling of an area held by so-called Islamic State. Turkish special forces entered Syria earlier as part of the offensive. 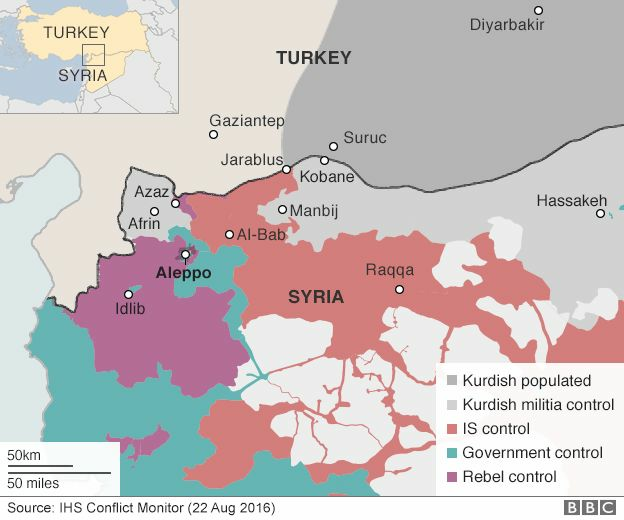 Turkey shelled Syrian Kurdish forces in the region this week, determined not to let them fill the vacuum if IS leaves, the BBC's Mark Lowen reports from Gaziantep, near the Syrian border. The concern in Ankara is that the Kurds could create an autonomous area close to the border which might foster Kurdish separatism within Turkey itself, our correspondent says. In another development, counter-terror police in Turkey's main city, Istanbul, launched dawn raids targeting IS suspects across the city, Turley's Dogan news agency reports. US Vice-President Joe Biden arrived in Turkey on Wednesday in the highest-ranking visit by a Western official since the failed coup on 15 July. How dangerous is the instability in Turkey? 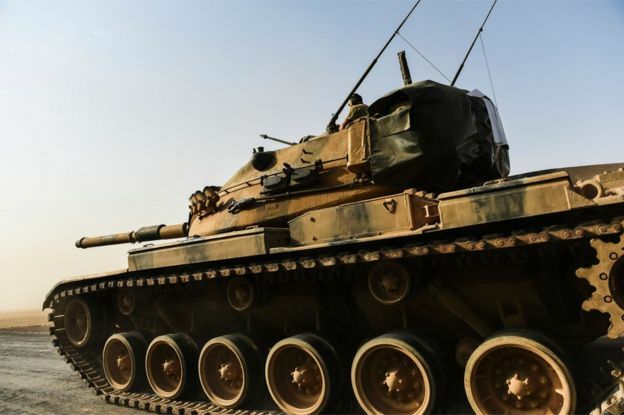 According to a photographer for the AFP news agency, the tanks were followed by several smaller military vehicles believed to be carrying Turkish-backed Syrian rebels. Shelling began at about 04:00 local time (01:00 GMT), with 224 rounds were fired at 63 targets in the space of one hour and 45 minutes. Air strikes by Turkish and US planes began just after 06:00, Turkish media report. The Turkish town of Karkamis - just across the border from Jarablus - was evacuated as a precaution following earlier IS mortar attacks. 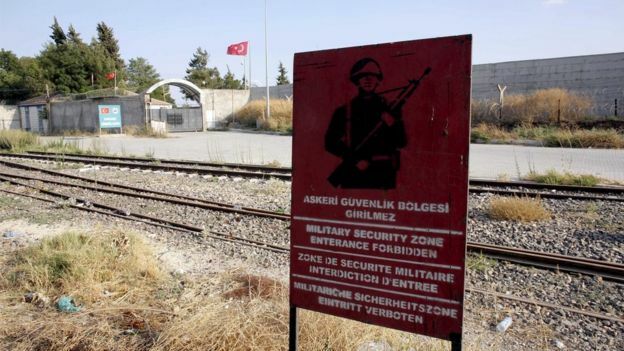 Turkey has vowed to "completely cleanse" IS from its border region. 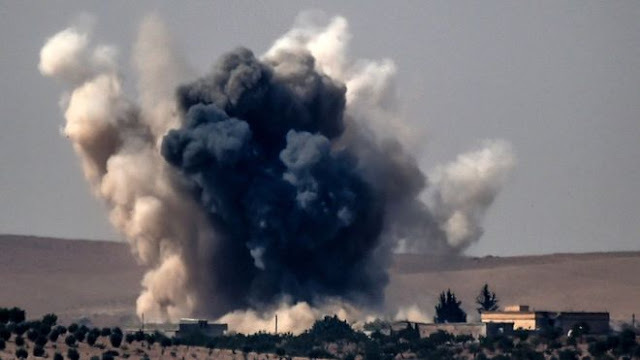 "The Turkish Armed Forces and the International Coalition Air Forces have launched a military operation aimed at clearing the district of Jarablus of the province of Aleppo from the terrorist organisation Daesh [IS]," said a statement from the Turkish prime minister's office. Turkey blames IS for a bomb attack on a wedding that killed at least 54 people in Gaziantep on Saturday. Turkey's air strikes are its first inside Syria since the downing of a Russian jet in November. Moscow and Ankara only mended ties in June after punitive Russian sanctions. 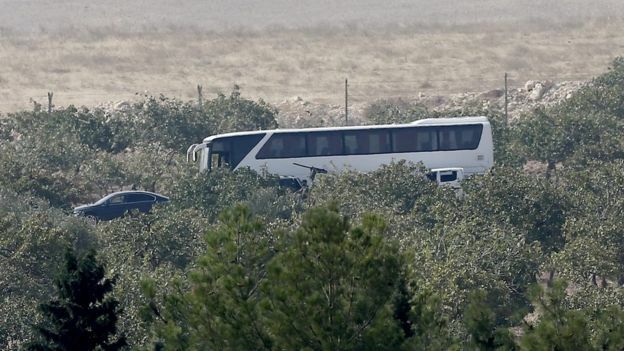 This is also Turkey's first known ground incursion into Syria since a brief operation to relocate the tomb of Suleyman Shah, a revered Ottoman figure, in February of last year. An unnamed senior US official in Washington told BBC News before the start of the Turkish operation that it was "partly to create a buffer against the possibility of the Kurds moving forward". "We are working with them on that potential operation: our advisers are communicating with them on the Jarablus plan. "We'll give close air support if there's an operation." Fighters from the Syrian Kurd YPG militia led the battle to drive IS out of the strategic crossroads town of Manbij earlier this month. Turkey views the YPG as an extension of the Kurdistan Workers Party (PKK), a Turkish-Kurdish rebel group fighting for autonomy since the 1980s, but the YPG is backed by the US as one of the most effective forces battling IS. On Tuesday the YPG took control of most of the north-eastern Syrian city of Hassakeh. A truce was reportedly brokered by Russia after recent clashes between the Kurds and Syrian government forces there.